Dr. Cardon is a 1985 graduate of Northwestern University Dental School. He completed a General Practice Residency at Offutt Air Force Base in 1986 and a two-year Advanced Education in General Dentistry residency at Wilford Hall Medical Center in 1998. He retired from the U.S. Air Force in 2007. Dr. Cardon has treated thousands of patients with missing teeth, damaged teeth and discolored teeth, utilizing the latest technologies like dental implants, veneers, and teeth whitening. r. Cardon has also published a book to further help his patients and community benefit from expert advice. He and his wife are the parents of four children. Dr. Cardon enjoys skiing, hiking, reading, and water sports. Debbie is a 1989 graduate of Merrell University. She was managing partner of Shear Technique Salon & Spa for several years before entering the dental career field. Since joining our team in 1993 she has attended many continuing education courses on customer service, practice management, and administration. Danielle is a graduate of State Technical College of Missouri where she received a certificate in dental assisting. She has enjoyed learning and expanding her knowledge here. In her spare time Danielle loves spending time with her family, especially in outdoor activities. 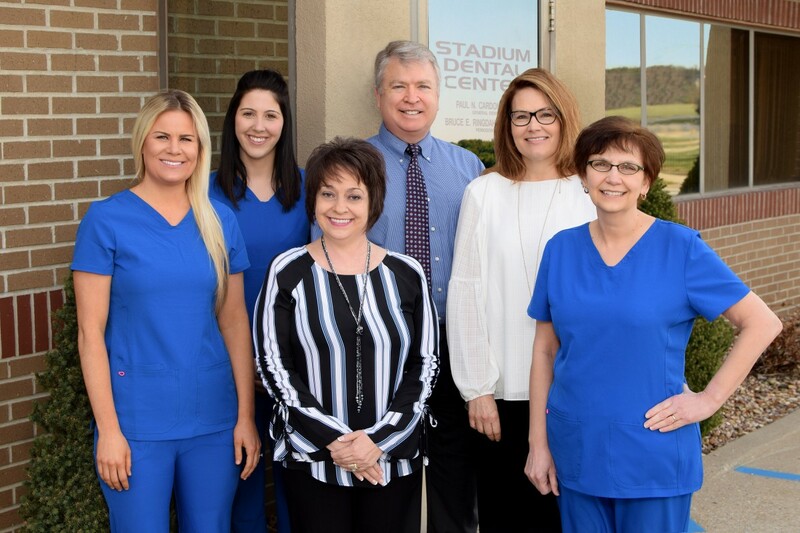 She loves what she does and brings a ton of energy and teamwork to Stadium Dental Center. A native of Hutchinson, Kansas, Mendy received her Associates degree in Applied Science from Iowa Western and Creighton Dental School. Her membership in the American Hygienists Association and Missouri Hygienists Association reflects her commitment to uphold the highest standards of her profession and to provide excellent care and service to our patients. She enjoys helping our patients experience and understand the overall health benefits of complete oral care. Mendy practiced previously in Macon, MO. Together with her husband Mike and their three children, Easton, Nolan, and Claire, she enjoys hanging out as a family and cheering them on in hockey and baseball.